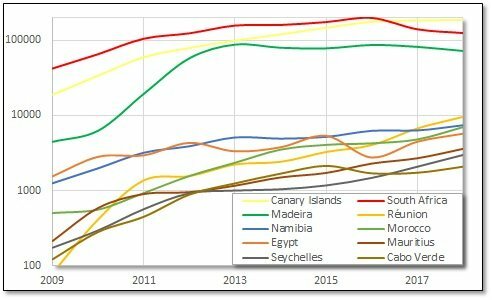 The first graph shows the top 3 (South Africa, Canary Islands and Madeira) on a linear scale. The second graph shows the top 10 on a logarithmic scale. 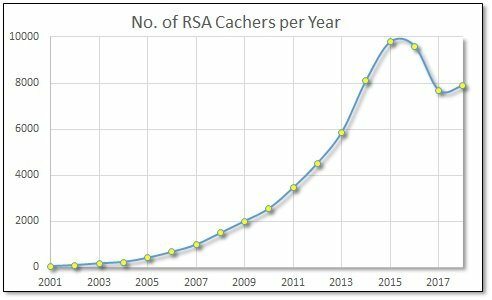 7880 cachers logged at least one South African cache during 2018. Of these, 1535 logged at least 12 (my arbitrary definition of an "active" cacher). Whatever the problem in South Africa may be, the rest of Africa does not suffer from it. 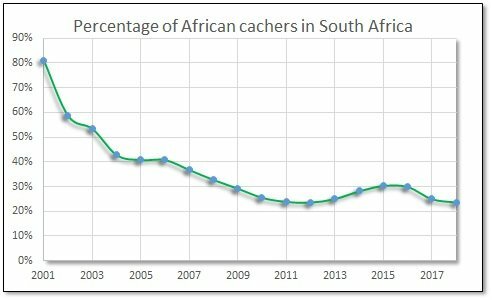 33262 cachers logged at least 1 African cache (26026 outside of South Africa) during 2018. In 2013 iPajero logged 2415 African caches. That is 6.6 per day, or one every 3.6 hours! I am also enjoying all the stats, thank you Danie. 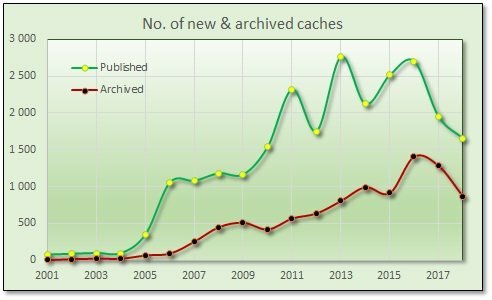 Of the 7880 cachers who logged at least 1 cache in South Africa during 2018, 2169 only logged a single cache. This is 27.5% of the total. 1534 logged 12 or more caches: 19.5% of the total. 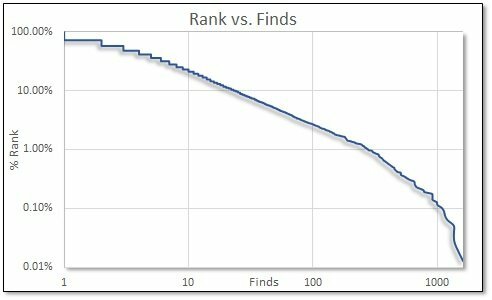 Because of a small number of very active cache finders, the average is highly skewed: 15.9 finds. I found this one interesting. 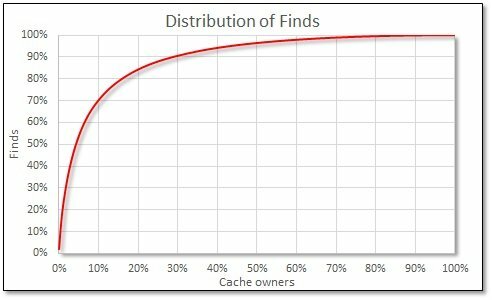 How to interpret this graph: The horizontal axis is the percentage of cache finders (sorted from most to fewest finds), and the vertical axis is the cumulative percentage of finds. 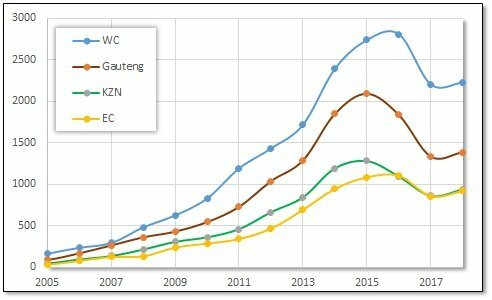 What this means, for example, is that the top 20% of South African finders (red line) have found 83% of all the South African finds for 2018, vs. the 75% of all the rest of Africa finds (blue line) by the top 20% of rest of African finders. 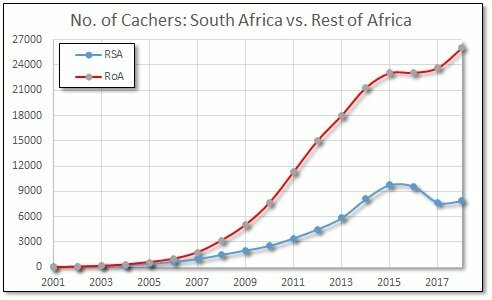 The fact that the blue line is below the red line means that proportionally more caches are found by fewer cachers in South Africa than in the rest of Africa. 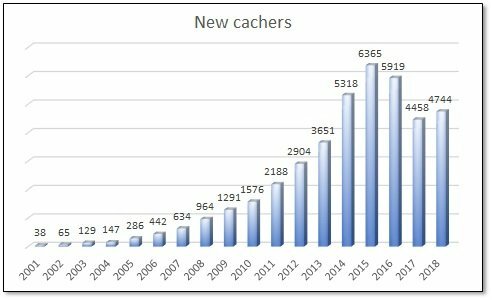 There were 4744 cachers who logged their first South African cache during 2018. This number is an incredible 60% of the total number of cachers last year! 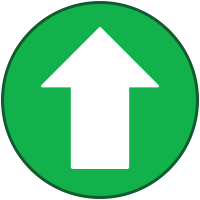 This represents an increase of 6.4% from the previous year. The second graph zooms in on the first 15 days. 53769 cachers (34.6% of the total) have only cached on a single day. Jors has the longest African career, with 17.9 years (and still going strong). It gets even weirder. 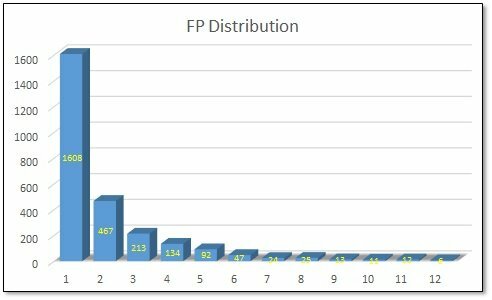 I calculated the distribution per day for 4 years, and it turns out that the period is not a year, but 368 days. And the effect is not small - the peaks are about twice as high as days 2 weeks earlier or later. 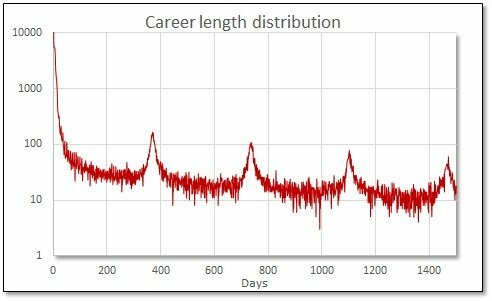 (The graph below has a logarithmic scale; the peak to trough difference is about a factor 8.) 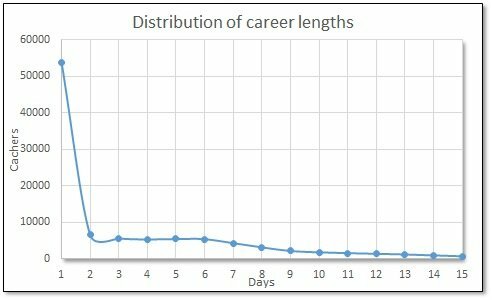 So why would a typical cacher be so much more likely to stop after multiples of 368 days than random chance would predict? I have spent some time trying to find some logic for this unusual fact. I am sure that is is not a normal statistical phenomenon. A fixed yearly caching spree is the only mechanism I can think of that will force a cacher's first and last finds to be at discrete intervals. I still can't explain why it is not 365 days. Maybe it is just noise in the data (although the peaks appear to be quite clear). What about cachers that start and pay for Premium and stop when it expires. For this to effect the stats one has to assume the cacher takes out premium membership soon after they start and only carry on caching for a while after expiry. Very interesting stats. Thanks very much! 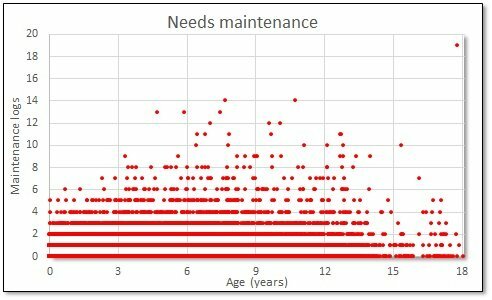 I was wondering if you can generate some stats on cache maintenance and age? I've noticed many caches which are placed and then unfortunately not well taken care of after publication. 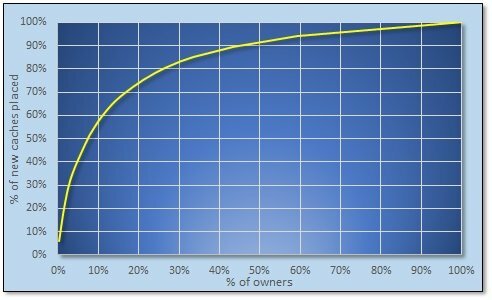 Which caches have the highest number of owner maintenance logs? 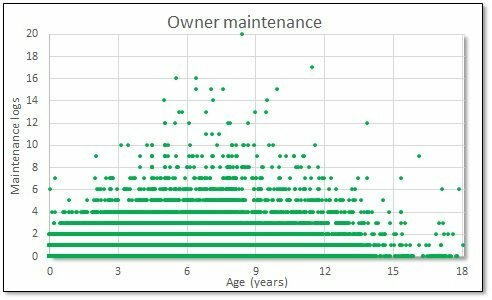 Is there a correlation between cache age and owner maintenance logs? I expect there would be in certain areas but then again there are caches hidden in remote places that, if hidden in good containers, won't really need any TLC after publication - I've found quite a few like this. Can you also tell us which are the loneliest caches (caches with the longest time since they were last found) in SA and per province? I revisited a cache I found back in 2012 on Saturday and was very surprised to see that the last found it log was in 2015! I also found a cache in 2013 and to date it hasn't been found again yet . 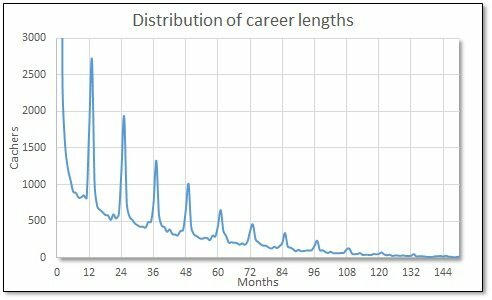 I was wondering if you can generate some stats on cache maintenance and age? 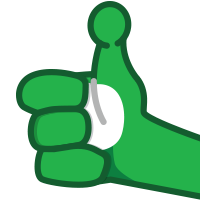 Thanks for the input - it helps with the difficult task to keep coming up with new stuff! I still have a few 2018 statistics which I would like to get to first (before 2020 😉) and then I'll get to your requests. These 10 were responsible for 33.8% of all the new caches last year. Half of all the new caches were placed by the top 22 (7.5% of the total number of owners). 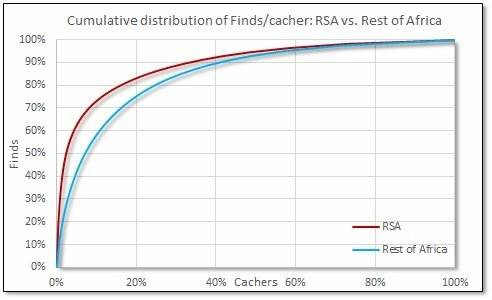 80% of the new caches were placed by the top 77 (26.4%). 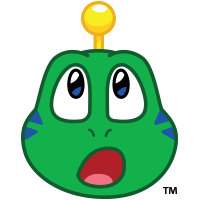 91.3% of the new caches were placed by the top half. 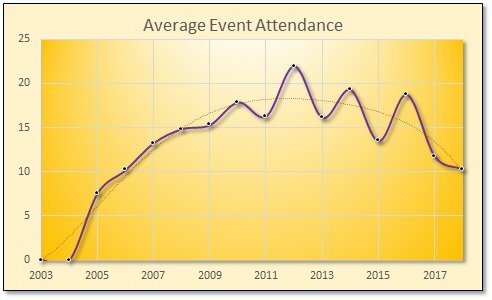 I am not surprised by the event statistics. 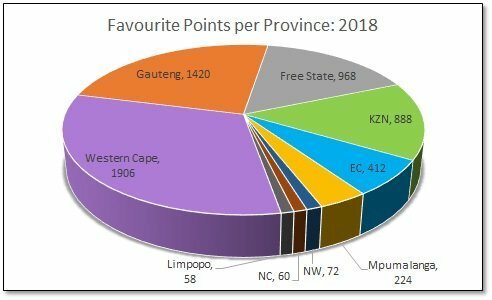 In our area(Nelson Mandela Bay) it went from about 15% in 2017 to about 31% in 2018. 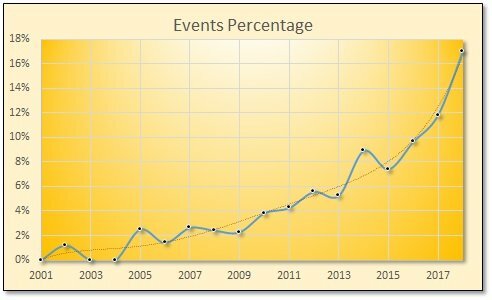 Although the total amount of new caches was about the same, the number of events, more than doubled. It could be an interesting discussion why that would be the case. Thank you for keeping us entertained with all the stats, Danie. 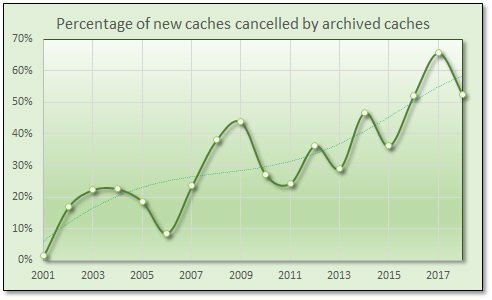 The next graph shows what percentage of the new caches is cancelled out by caches getting archived. Once again I excluded events. When this upwards trending graph reaches 100%, it will mean that there will not be any net growth during that year. 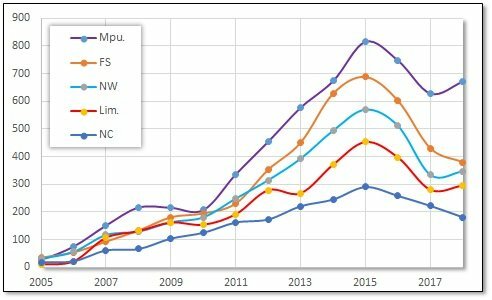 The last graph is a different way to look at the previous one - it shows the net growth in cache numbers each year (excluding events). Peak growth was in 2013; we are currently sitting at about half the rate of 2013. 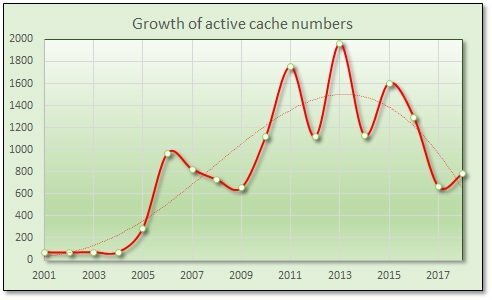 If the trend of the last 5 years persists, we may reach the point where the actual number of findable caches shrinks, as early as next year (2020). 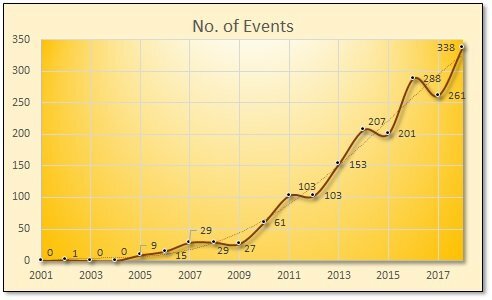 Although the total amount of new caches was about the same, the number of events, more than doubled. 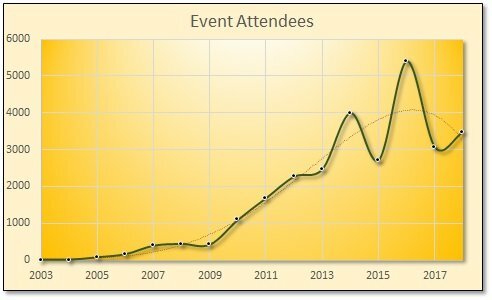 At this stage I have no theory why events have become so popular. 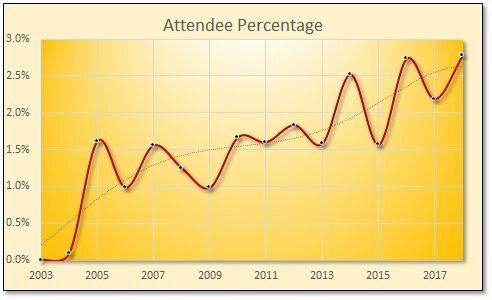 I plan to look at the number of event attendees in a follow-up post; this should show if they really are more popular. The number is definitely coming down; we are currently at half of the peak in 2012. Maybe we have too many events? It confirms the trend we saw in part 20 - not only are there more events now, but it gets a bigger fraction of the logs as well. Unless there are specific requests relating to yearly statistics, this concludes this series. 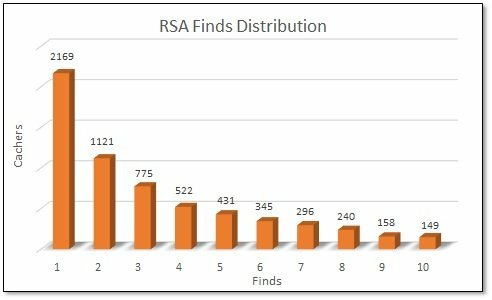 Both of these are for all South African caches (archived as well as active caches). I found this interesting - it appears as if caches slowly accumulate maintenance logs up to about 8 years. Those that last longer tend to have fewer maintenance logs. I assume it has to do with excellent location and quality construction from the start. Archiving as a result of maintenance logs? 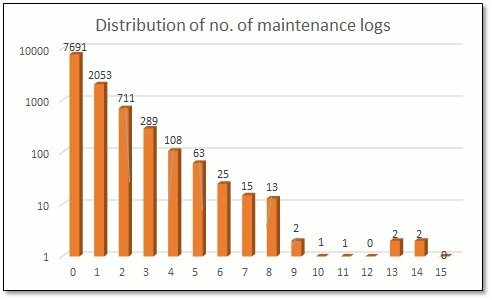 What about the rate of maintenance logs? 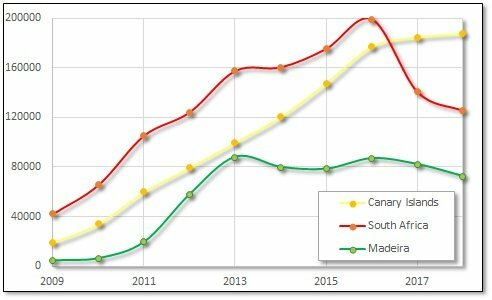 This graph shows the distribution of the average rates for archived South African caches that lasted at least one month. I found this one very interesting and unexpected. 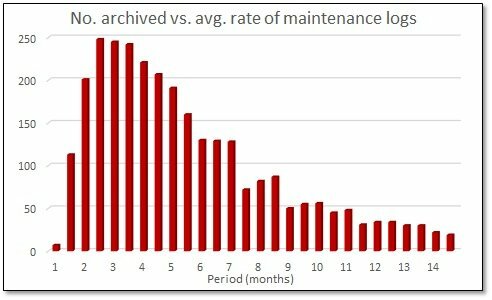 What it tells us is that a cache is most likely to be archived if it receives Needs maintenance logs at a rate of one every 2.5 to 3.5 months (bars 4 - 6). This should at least trigger Owner maintenance logs. The green graph, however, does not confirm this theory. Or did you mean maintenance by non-owners? Maintenance by non owners. In other words a cacher that gets to an old cache with a smashed container where the CO is no longer active is more likely to replace the container than they would a new cache with an active owner. The latter getting a needs maintenance log. People seem reluctant to post a needs maintenance log. They rather make a note in the Found Log that there is an issue. That is my experience on my caches.